� Branagh is the only women's player to twice be named AVP's Most Improved Player. � Her first six AVP victories occurred in the Central or Eastern Time Zone before winning five California events in 2009... 11 of her 17 AVP wins have come in the events she has played in the Central or Eastern Time Zone. � Branagh and Elaine Youngs did not win a medal in their first eight FIVB events, then proceeded to win medals in seven of the next 11 tournaments en route to qualifying for the Beijing Games. 2017: Branagh played one AVP event with Xi Zhang, then twice with Brandie Wilkerson, getting a best of second. She finished the year ranked sixth in aces (.93 per set) and 10th in hitting percentage (.432). Branagh played three times with Kerri Walsh Jennings on the FIVB Tour, with a best of fourth, and one time with Emily Day, placing 17th in the World Championships. 2015: Branagh and Dowdy played one AVP event, then Branagh and Jenny Kropp teammed up for six AVP tournaments. The duo advanced to four title matches, the most of any team on tour, winning once. Branagh was fourth in digs per set (5.53), sixth in aces (.84) and sixth in hitting percentage (.441). On the FIVB Tour Branagh played once each with Jennifer Fopma and Kropp, with a best of ninth. 2014: Formed a partnership with Amanda Dowdy, finishing fifth three times in their five AVP tournaments. Branagh ended the year ranked fourth in aces per set (.85) and sixth in digs (5.00). Branagh and Whitney Pavlik played once on the FIVB Tour, finishing 25th. 2013: Branagh and Lauren Fendick played twice on the FIVB Tour, with a best of 17th. 2012: Branagh and Walsh Jennings placed second in both AVP events. On the FIVB Tour, Branagh competed in six events with five different partners, getting a best of fourth. 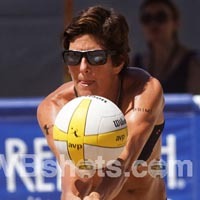 2011: Branagh teamed with Angie Akers and placed third in the only AVP event. Internationally Branagh and Akers reunited for the first time since 2005, getting a best of fifth two times in their 13 FIVB events together. She concluded the year with one event alongside Brittany Hochevar. 2010: Branagh formed a new partnership with Misty May-Treanor. In the season opener in Fort Lauderdale, the duo won, becoming the first team to win a domestic event in their first tournament since 2002 and just the second team to do so since 1996. The duo advanced to the semifinals in six of seven AVP events, and five of their six losses were three-set matches. They also won the final AVP event in Long Beach. On the FIVB Tour Branagh and May-Treanor advanced to three semifinals in their first five events, with a best of third place, before going four straight tournaments finishing ninth or lower. Branagh then teamed with Kerri Walsh for the final two FIVB events, placing fifth before winning in Phuket. 2009: Branagh and Youngs appeared in the championship match in each of their first 13 AVP events, winning nine times. Branagh won her first Manhattan Beach Open title as the duo swept all seven opponents. She ended the season second in hitting percentage (.483) and fifth in aces per game (.81). Internationally the duo placed fifth in the World Championships before claiming the bronze medal in the Gstaad Grand Slam and a silver in Klagenfurt. They won three medals in five events. 2008: Branagh and Youngs advanced to the semifinals in 11 of 12 events and to six finals. The duo won two events and finished as the third-ranked team on the Tour. For the second straight year, they won the Cuervo Gold Crown Championship. Finished third in aces per game (.90) and fourth in hitting percentage (.458). On the FIVB Tour, they won four medals in eight events en route to qualifying for the Beijing Olympics. In claiming the title in Barcelona, became just the second team to rebound from a second-round loss to win an event. Branagh and Youngs were fifth in the world in qualifying, and placed fifth in Beijing. Following the Olympics, Branagh competed in Dubai with Kerri Walsh, and the pair won in what was their first event together. In the final two events of the year, Branagh played with Tyra Turner, placing second and third. 2007: Played the entire season with Youngs, and won her first event in the season opener in Miami. Branagh and Youngs were in the semifinals in 12 of 14 events, winning three of the 10 finals they competed in. Their second win, in Seaside Heights, set the mark for the longest match in AVP history (1:41). Finished as the second-ranked team on the Tour and won the Cuervo Gold Crown Series as the only team to play in all three of the finals in the first three events, earning a $100,000 team bonus. Finished second in kills per game (7.48), sixth in aces (.90) and ninth in hitting percentage (.431). On the FIVB Tour, they played in eight events, earning two bronze and a silver medal in their last three tournaments. 2006: Prior to the season, played two events on the Australian Tour with Angie Akers, finishing fifth and second. Played alongside two Olympic Bronze medalists in 2006, Holly McPeak and Elaine Youngs. Advanced to nine semifinals and two championship matches en route to an individual ranking of eighth in terms of season points. Statistically she led the Tour in kills per game (8.42), was fifth in hitting percentage (.453) and seventh in aces (.72). Competed on the FIVB Tour for the first time, with a best of fourth (in Vitoria, Brazil) in eight events. 2005: For the second straight season, played with three different partners, and had a best of fifth (Boulder). Earned Rookie of the Year honors after chalking up four wins over teams seeded eighth or better, while losing just once to a team seeded below her. 2004: Advanced to the main draw in her third event ever (Belmar) and placed 13th, earning her a spot in the main draw which she never relinquished. While she didn't have enough games to qualify, had 25 aces in 26 games played, which was the highest average on the Tour. College: At Minnesota she was a two-time second-team All-American and in 2000 was the co-Player of the Year in the Big Ten Conference. Was first-team all-conference three years after getting honorable mention her freshman season. When she finished playing, she had tallied the most kills ever in Big Ten history (2,379), and ranked third in career digs in school history. Her career kill total was sixth in NCAA Division I history, yet she had played in fewer games than any of the top five. In 2014 she was inducted into the school's Hall of Fame. Personal: A member of the U.S. National Team from 2001-2003, and played for the bronze-medal team in the Pan-Am Games in 2003. She played professionally in Japan and Italy after graduation. She was also named MVP of the USPV Championship Tournament after helping the Minnesota Chill to the 2002 title. She has a daughter, Tegan, born in November 2013, and a son, Will, born in July 2016.